Cannon Design's Open Hand Studio. 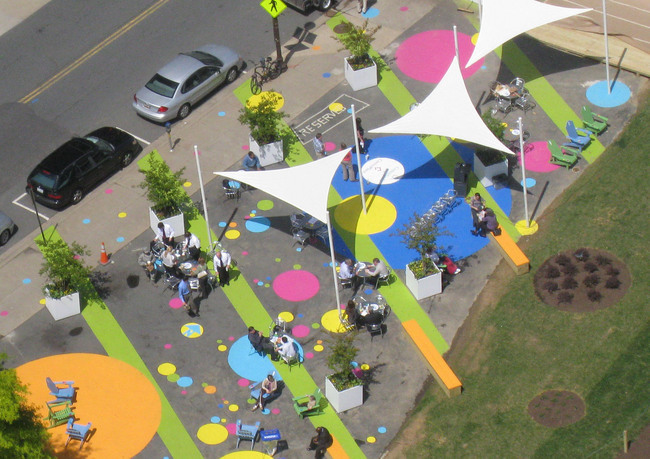 CentralSpace, a public plaza with rain garden and shade structures adjacent to a major transit hub - designed by Cannon in partnership with the Rosslyn Renaissance Urban Design Committee, 2010, Rosslyn, VA. Courtesy of Cannon Design. 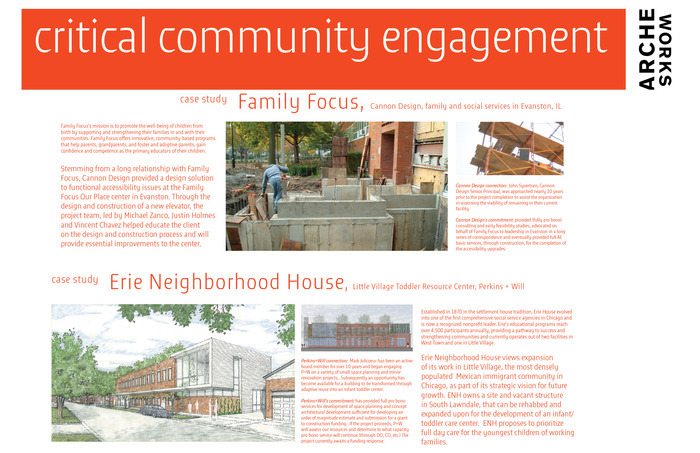 Archeworks New Practice program brings attention and energy to the topic of socially engaged design. The program will develop and test new definitions of socially responsible practice; promote actionable leadership and civic innovation among designers; and create a public platform that conveys important messages about civic leadership and emerging practices in the design field. This program emphasizes experimentation and innovation, and connects thoughtful discourse to experiential learning, core tenets of Archeworks' mission. 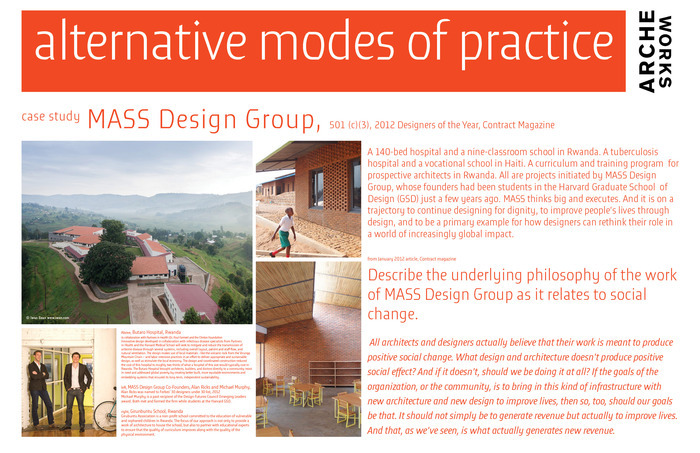 Multidisciplinary design practitioners test new approaches to integrated practice, both through engaged peer-to-peer dialogue and socially engaged work. Using Chicago as a living laboratory, we are creating a new base of "resident knowledge" about emerging models of socially engaged practice and demonstrate the public value of designers. This program encourages practitioners not only to "learn by doing," but to "lead by doing," and to share their learning about integrating socially engaged practice with a broad public. John Syvertsen is a senior principal of Cannon Design with overall authority for overseeing the firm's environmental sustainability and community-outreach efforts. Over his more than thirty-year career, John has devoted himself to design excellence, focusing much of his time on working with colleges and universities across the United States. Civic engagement is a hallmark of John's philosophy. He is a former chair of the National Committee on Design of the American Institute of Architects, past president of the Chicago Chapter of the American Institute of Architects, and past chairman of the Chicago Architecture Foundation. 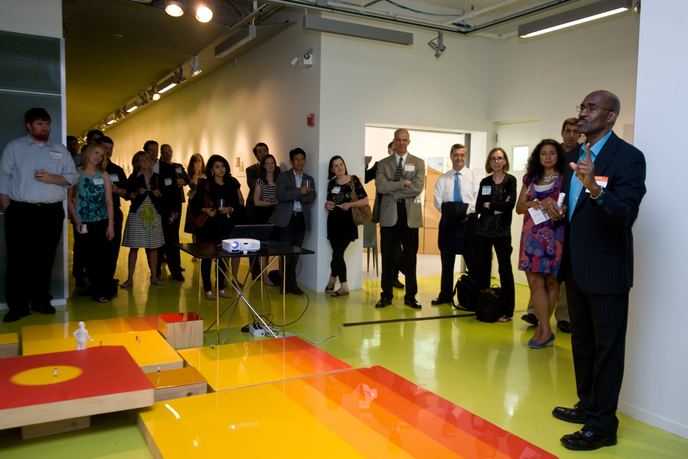 He also serves on the Board of Archeworks, the American Architectural Foundation, the University of Washington Architectural Commission, the University of Illinois at Chicago Chancellor's Design Review Committee, and the Board of Overseers of the College of Architecture at Illinois Institute of Technology. Susanne Schnell has a broad background developing collaborative initiatives in the areas of community development, cultural heritage, and corporate social responsibility. As managing director of Archeworks, she oversees a multidisciplinary design education program and facilitates team-based design projects serving diverse community partners. Schnell held prior positions with the Civic Committee and Civic Consulting Alliance, where she developed partnership initiatives in inner-city economic development, workforce development, and heritage preservation, including a lead role launching the Historic Chicago Greystone Initiative. Previously, in Washington D.C., Susanne directed a grant program and national education campaign promoting public–private partnership reinvestment strategies in underserved communities. Founded in 1994, Archeworks is a multidisciplinary postgraduate school dedicated to advancing design in the public interest and inspiring collaborative action to shape more ecologically sustainable cities.